There’s a lot more to CAPTAIN MARVEL than just Brie Larson’s heroine, Carol Danvers. The film introduces a whole set of new concepts and characters to the Marvel Cinematic Universe. From alien races to new superheroes, CAPTAIN MARVEL promises to redefine the future of the MCU — here’s some of what you can expect to see. 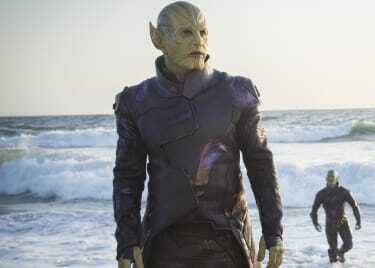 First up we have the Skrulls. This race of alien shape-shifters was created for Marvel comics by Stan Lee and Jack Kirby back in 1962. The Skrulls are brutal warmongers who have long coveted Earth. They’re masters of subterfuge, and their favorite method of conquest is to infiltrate a planet’s defenses and bring it down from within. 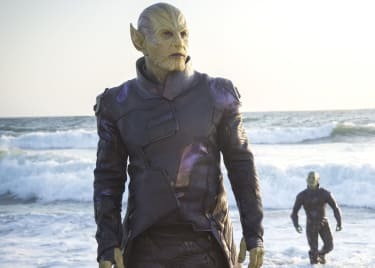 The Skrulls are famously associated with the 2008 “Secret Invasion” event, which saw the aliens using those tactics to bring down both S.H.I.E.L.D. and the Avengers. 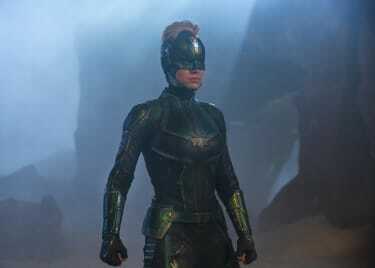 Technically, we’ve already met Kree renegades in the MCU, but CAPTAIN MARVEL is the first film to really explore this war-like culture. The Kree are another Lee/Kirby creation, and the blue-skinned aliens are one of the most fearsome races in the comics. They’re known for being inventive and ruthless in the ways of war. The Kree have conducted countless genetic experiments upon other races, hoping to create warriors to fight on the frontlines. CAPTAIN MARVEL dives deep into Kree society and the race’s home world, Hala. Carol Danvers is introduced as a member of an elite Kree strike team known as Starforce. This is a pretty deep cut into comic book lore. The roster has been switched up a bit for the film, however. A number of minor Kree supervillains now fill out the Starforce ranks. The most notable is Minn-Erva, a Kree geneticist with powers similar to Carol’s. Jude Law plays the commander of the Kree Starforce. Leading up to the release of CAPTAIN MARVEL, Law shied away from confirming any details about his role. Speculation swirled that he was playing Mar-Vell, the Kree superhero who served as Carol Danvers’s inspiration in the comics, or a more ruthless Kree called Yon-Rogg. Significantly, Yon-Rogg was the main villain in one comic book arc that saw Captain Marvel develop amnesia. To find out, you will just have to see the film! Because CAPTAIN MARVEL is set in the ‘90s, the film shows us a very different generation of S.H.I.E.L.D. The old guard is in the process of stepping down, and the film introduces us to a young Nick Fury, a man who’s within a hair’s breadth of quitting S.H.I.E.L.D. — before he meets Carol Danvers. Of course, he winds up taking the job as head of S.H.I.E.L.D., defending Earth against threats on a scale no other S.H.I.E.L.D. director could have conceived of. The trailer introduced viewers to Carol’s fellow USAF pilot, Maria Rambeau, played by Lashana Lynch. It’s reasonable to assume Rambeau will be an important secondary character, helping Carol to recover her memories and learn the truth about her past. But she’s also a nod towards another character. In the comics, Maria is the mother of Monica Rambeau, the superhero named Photon. While Captain Marvel is set in the ’90s, Carol’s future lies in the present day, so presumably Monica herself could appear in a sequel. Marvel Studios president Kevin Feige has hinted that CAPTAIN MARVEL will lay the groundwork for another new hero: Kamala Khan, aka Ms. Marvel. Khan is a relatively recent character, as she was created in 2014. Yet the teenage hero is one of Marvel’s most culturally relevant figures. Feige has teased a comic-book-accurate portrayal, envisioning Kamala as a young Muslim-American who is inspired by the heroism of Carol Danvers. Tom Holland’s Spider-Man shows some of the inspirational effect MCU heroes are having on kids who grow up in a world filled with superheroes, but Kamala Khan would push that idea into a new realm. 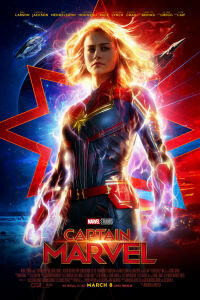 Captain Marvel is playing now at an AMC near you.